With less than three weeks to go before the Iowa caucuses, the leading Republican presidential candidates met on the debate stage for the sixth time Thursday night. The candidates discussed everything from fighting ISIS, to gun control, taxes and more as each individual made their case to the American people for why they should be their party’s next nominee. Last night’s debate was the smallest GOP debate thus far, with just seven candidates on the stage: businessman Donald Trump, Senators Ted Cruz and Marco Rubio, neurosurgeon Ben Carson, and Governors Chris Christie, Jeb Bush and John Kasich. Republican front runner Donald Trump is not the best debater in the world. His answers are nearly always vague and seemingly unprepared, and some of his responses are largely nonsensical. In fact, compared to the other six candidates on the stage last night, Trump is probably one of the worst when it comes to actual, issue-based political debates. Fortunately for Trump, none of that matters in a presidential election that is essentially shaped by every move he makes. Trump can run the show by appealing to the emotions and anger of the audience with fiery responses to important questions — even though many of his responses can hardly be considered answers at all. For a debate to have a significantly negative impact on Trump’s standing in the polls, he would probably have to be the absolute worst candidate on stage. But given his impressive ability to run a show however he likes, that’s not likely to happen anytime soon. Last night was probably Trump’s best debate so far. He wasn’t perfect, but he discussed some of the central issues of his campaign — such as his proposed ban on muslims entering the United States — with ease and in a way that will certainly fire up his supporters. Unlike in previous debates, Trump was active the entire time and interjected on a variety of topics. He also attacked Ted Cruz effectively on the Senator’s “New York values” comment. Yes, Trump was far from perfect. But he also wasn’t bad, and anyone who went into the debate committed to vote for him likely won’t be changing their minds any time soon. As usual, Trump didn’t tank. And as always, that’s a major win for him. One of the biggest questions entering last night’s debate was how Ted Cruz would handle the “birther” issue. Cruz has been picking up steam of late and has a slim lead over Trump in Iowa, but questions about his citizenship have hampered his campaign for much of the past week — questions posed primarily by Trump himself. Cruz has been a U.S. citizen since birth but some wonder whether he is eligible to run for president since he was born in Canada (to an American mother). While the issue isn’t likely to hurt Cruz in the election, the fact that the narrative for the past week has been his citizenship controversy and not, say, his lead in Iowa, is a major problem for his campaign. But Cruz handled the situation perfectly. The Senator remained cool and collected when Trump and the moderators questioned him on the issue, and then claimed that the only reason Trump is making a big deal out of it is because Cruz is catching fire in Iowa. While Trump hasn’t outright said that Cruz is ineligible to run for president, the fact that he has made the “birther” controversy linger over Cruz is definitely an unwelcome sign for the Senator’s campaign. But if Cruz continues to address the issue effectively like he did last night, Trump will have to come up with another way to stop the fast-rising Senator’s momentum. 3) Marco Rubio dominates, but does it matter? With six GOP debates in the books, there’s no doubt that the most talented candidate when it comes to debating is Marco Rubio. The Florida Senator has won arguably every single debate thus far and outperformed everyone in last night’s debate as well. Rubio can speak knowledgeably on seemingly any topic — from immigration, to fighting ISIS to the economy and more. Rubio — who is currently in third place in Real Clear Politics’ national GOP polling averages — has also shown a great ability to deflect attacks with ease and use rehearsed lines with incredible effectiveness to take down his opponents. Last night was no exception, as Rubio arguably had his best debate performance thus far. Rubio was strong and decisive on nearly every point he made, whether he was discussing the U.S.’ role on the world stage, gun control or the economy. The Senator spoke with anger and emotion on issues that fire up the Republican base (i.e. gun control) and consistently criticized the Obama administration and Democratic front-runner Hillary Clinton for their views and policies. Despite Rubio’s strong performance in last night’s debate, it’s unlikely that the race will shift dramatically in his direction anytime soon. Rubio is a part of a GOP establishment that has struggled mightily to combat the angry, populist sentiments of a significant portion of the Republican base. These sentiments have propelled the likes of Trump and Cruz into legitimate contenders, but it has also crippled the campaigns of establishment mainstays like Rubio, Bush and Kasich. One of the best moments of last night’s debate was when Rubio criticized Cruz for changing his views on several issues. The exchange was great for Rubio and bad for Cruz, but — like the rest of the debate — it probably won’t have much of an impact on either candidate’s standing in the polls. Like Trump, New Jersey Governor Chris Christie may have had his best debate of the campaign last night. Christie made it a point to get involved in almost every contentious moment of the debate, and unlike Ben Carson, did everything in his power to avoid falling into the background of the Trump and Cruz Show. But, more than anything, Christie went after the Obama administration all night long. He criticized the president on everything from his foreign policy to his use of executive orders to increase gun regulations in the United States. Right now, it’s unlikely that Christie will win the Republican nomination. He’s polling at just 3.5 percent in Real Clear Politic’s national averages, and he doesn’t fare much better in the early voting states of Iowa and New Hampshire. But Christie’s anti-Obama message is one that resonates with most Republican voters, and his attacks on the administration last night surely fired up his supporters and endeared some of those who are still on the fence. Only time will tell if it has any real impact on the election. 5) A good debate, but will it affect the race? With the Iowa Caucuses and the New Hampshire primary rapidly approaching, many expect the Republican field to begin to shrink at any moment. But as yesterday’s debate showed, it’s unlikely that anything that happens between now and then will have any real impact on the race. According to Real Clear Politics, Trump has a commanding lead in New Hampshire. Iowa is a tossup between him and Cruz right now, and it’s likely that the caucuses will go down to the wire. Other than that, though, the race isn’t very close. 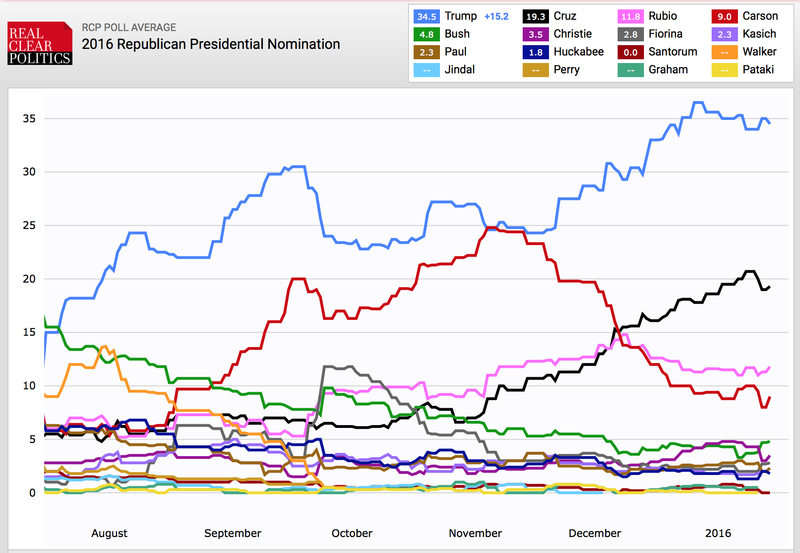 Trump leads Cruz nationally by over 15 points, and the other candidates are all polling at or near single digits. This will change once some candidates inevitably drop out, but right now, it’s unlikely that last night’s debate will have much of an impact on the polls. The GOP candidates will meet on the debate stage again on Jan. 28 in Iowa. That debate will be the last one before the Iowa caucuses, and it could play a major role in determining the winner of the nation’s first primary contest.